Total: 1 hr. 5 min. Bright kiwi crowns a luscious cheesecake. Bake at 350°F for 6 to 8 minutes until golden and set. Cool. While the crust cools, beat the cream cheese in a mixing bowl until creamy. Add sugar, lime juice, and vanilla. Beat an additional 3 minutes. Beat in the eggs until combined. Pour on top of cooled crust. Bake at 350°F for 25 to 30 minutes, until edges are lightly browned and filling is set. It will firm up as it cools. Cool on a wire rack and then move to the refrigerator for at least 1 hour before cutting. Shortly before cutting the bars, combine sugar, water, and lime juice in a small pot. Heat to boiling over medium-high heat. Cook until slightly thick and syrupy, stirring often. Remove from heat and stir in kiwi pieces. Remove the bars from the casserole dish and cut into squares. 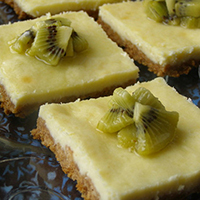 Garnish each square with a spoonful of the kiwi. Serve and enjoy. Store leftovers in the fridge.